As I was preparing for bed the last night I was in my thoughts, trying to recall a very common and simple verse, to no avail. I became frustrated with myself, feeling foolish and embarrassed by my inability to do what should have been made doubly simple by the fact that I wear the verse constantly, in the form of a mobius bracelet on my wrist. I have worn it for years, it was a most unexpected gift which I received when I was very low and needed something to help me hold on. It is worn and slightly worse for wear but is a good reminder to hold fast to hope and faith, especially in adversity. As angst began to surface over perceived ineptitude last night, I made my way to my room and picked up my bible; I had planned to continue my previous reading and would find the verse in the morning when I was rested and clear. So, what's up with this drawn out intro? Well, I had completely forgotten where I had been doing my reading last, as it had been quite a few different segments I had referred to as part of a sermon my Poppa bear and I had listened to together. I read a chapter and had this overwhelming urge to continue reading two more. I had been so tired moments before, that I was rather surprised by the sudden burst of calm alertness and drive to continue. What was I being led to and why? I read on and could not help but smile, lo and behold was the exact chapter and verse I had been struggling with. It was such a gift, there was a feeling of awareness of my silliness and how hard my thoughts and feelings can be towards myself. I took a moment to give thanks and nod my head in knowing and agreement. It was humbling and reassuring to know that God will always provide what is needed, even in the small moments when I am filled with doubt and unsure. 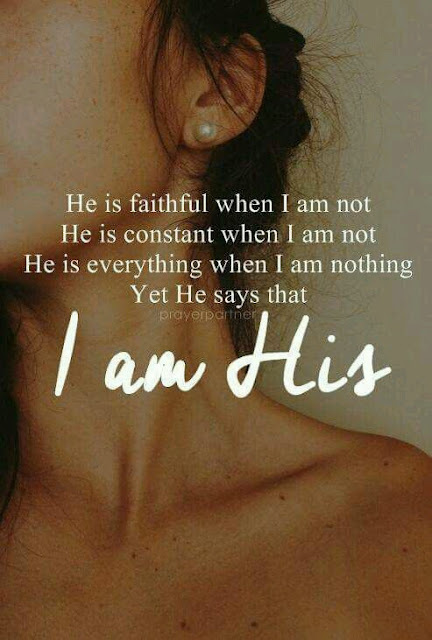 His presence and timing, His desire for my good, His mercy and gentleness, His ability to know where to find me and how to reach me in the most perfect way, His righteousness and strength of character are constant for all time. Oh! What warmth fills my heart at this knowledge. I spoke nothing aloud yet, Abba you were there listening and blessing me by filling me with the Holy Spirit which embued in my heart a desire to be in your word, reminding me that we are fiercely loved and wonderfully made, and that Jesus guides us home to you without fail. You see, as I was silently berating myself for what I perceived as my constant stupidity, He was watching, listening, and not liking the way I was directing hurt & impatience towards myself. He stepped in and removed doubt; I was filled with calm, lightness of being, gentleness, and most importantly love. Often there is such a harshness in the world when it comes to expectations, performance, response, knowledge, and aptitude. We take this harshness in and make it our own, self-monitoring and turning it into a mental form of brutalizing ourselves. We lose sight of the measure of our true worth, which by grace and mercy has naught to do with this broken world. I was gently reminded by God that there is a reason recalling verse can be a struggle for me, at times. I have a medical condition which effects my memory. It was discovered several years ago at University that I have a learning disability which went undetected for most of my life. This means that learning, retention and recall have always been a struggle for me, and that some days it is easier and some days it is not. I do not get to pick and choose. On a given day I can be brilliant and recall what others have forgotten or completely missed. Then there are days when I can re-read the same thing over and over, absolutely sure it is locked in memory for when I need it most; only to be crushed with disappointment by my perceived ineptitude, from myself and others. It is a struggle which God recognizes. I resent and fight against it, (all too often) and need to be made aware of, over and over that it is an opportunity to grow; that I am loved just as I am and as I am not. No matter what this world says or does, I am loved by Jesus, I am a daughter of the Most High, and am always worthful. If I could speak all the languages of earth and of angels, but didn't love others, I would only be a noisy gang or a clanging of a cymbal. If I had the gift of prophecy, and if I understood all of God's secret plans and possessed all knowledge, and if I had such faith that I could move mountains, but didn't love others, I would be nothing. If I gave everything I have to the poor and even sacrificed my body, I could boast about it, but if I didn't love others, I would have gained nothing. Prophecy and speaking in unknown languages and special knowledge will become useless. But love will last forever! Now our knowledge is partial and incomplete, and even prophecy reveals only part of the picture! But when the time of perfection comes, these partial things will become useless.